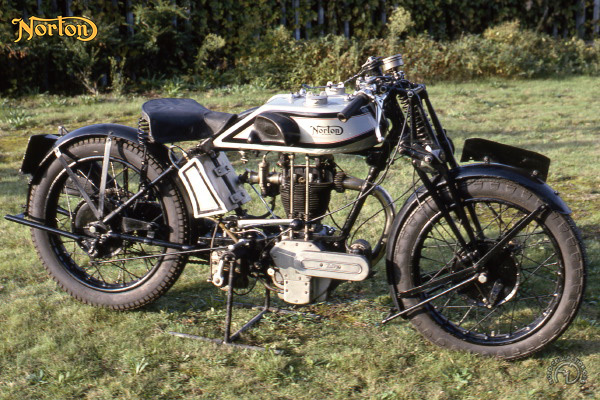 Designed by the firm's founder, James Lansdowne Norton, the first overhead-valve Norton was built in 1921. In 1922, Rex Judd set a British one-way flying kilometer record of 98.76 mph and a two-way world record of 89.92 mph on the new model at Brooklands. Only one prototype overhead-valve Norton took part in the 1922 IT, but its rider fell off on the last lap. But at the end of the season, Hubert Hassall placed second in the French GP and third in the Belgian GP and gave the model its first victory in the Ulster GP. Poor brakes cost the ohv Norton (now known as Model 18) the 1923 TT, so Norton's new designer Walter Moore adapted 8 inch brake drums from the latest Model T Ford. Alec Bennett won the three major classics, while two future car aces - Tazio Nuvolari and Achille Varzi - won the Italian Circuit of Cremona and the Spanish GP. In 1925- the year of "Pa" Norton's death – Bennett won in Belgium and Joe Craig in Ulster. The following year, a more modern Norton bike had pannier tanks. Roadholding was excellent, and the bike was endowed by Moore with an oil pump and two large drum brakes. Irishman Stanley Woods joined Norton in 1926 and won the Senior IT at a record speed of 67.54 mph: in the fall, Norton offered replicas of Woods's machine under the designation Model 25. Alec Bennett won the French GP again in 1926 on his 500cc Norton, but for 1927, Moore created the first overhead-camshaft Norton, the ES2. The Model 25 - otbervise known as the TT Replica - had an early form of saddle tank, created by sandwiching the top tube between two separate pannier tanks.